Said place should be dark and intimate. It should be hidden in an alley. It should be Alley, a secret new bar for rye-and-cabernet cocktails accessed via alley, now quietly open Wednesdays through Saturdays in Culver City. This place has late-night rendezvous written all over it. To begin, you’ll have a bite at the restaurant up front, Fin, or somewhere nearby—like Gravlax or Corner Door. Then, at meal’s end, here it comes: “I know a little place...” Right before you usher your date behind Fin, into an alley and up to an imposing doorman. So, yeah, bit of a trust exercise. Inside: it looks like a small piece of the Viceroy broke off and drifted away. It’s a dusky little blue-walled lounge with circular mirrors and white-wood animal heads. Soon you’re ordering a couple Cagneys (rye with brandied cherries and cabernet) at the black marble bar while blues, soul or ’70s rock plays. And when Al Green creates a need for one of you to run your fingers through some tassel-like curtains, abscond to the more private, couch-lined nook beyond. Note: tassel curtains. Everyone can still see you. 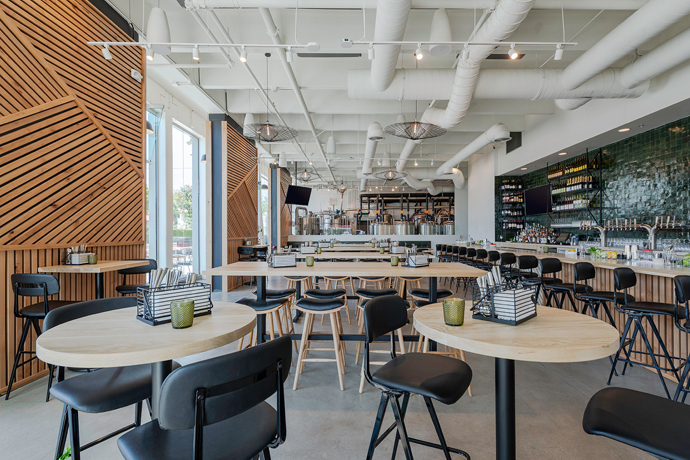 A Sunny, Miracle Mile Brewpub From Tony Yanow and Co.